It’s been one of my obsessions for some years that the UK economy is damagingly, dangerously, London-centric. Well, the polity as well as the economy; I argue here in a new VoxEU e-book with my colleague Prof Rob Ford that the ‘anti-Brussels’ Brexit vote can be considered an anti-Whitehall and anti-Westminster vote. Anyway, for years I’ve been working with people in Greater Manchester to chip in my small contribution to the city devolution agenda. This has started to bear fruit in the city devolution agenda, given real momentum by George Osborne in his time as Chancellor, and continuing with the forthcoming election of a Greater Manchester mayor. One of the people at the heart of Manchester’s long campaign for the devolution of economic power, and political accountability, is Mike Emmerich. Now running his own company (Metrodynamics), Mike spent 20 years in public service, latterly in Manchester, where he played a pivotal role in bringing about the devolution revolution. 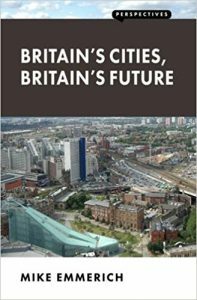 He has written a terrific book about this important moment in the life of the country’s cities – and the nation: Britain’s Cities, Britain’s Future. The book is the latest in my ‘Perspectives‘ series, so clearly I loved it enough to publish it, with my partners at LPP. Setting that aside, though, the next few years are going to be a challenging time for the UK as the government sets about getting the worst possible Brexit deal (or so it often seems). Even without this impending upheaval – the UK’s economic record has been pretty dismal, our level of productivity stubbornly much, much lower than in the other big OECD economies, the regional disparities among the widest in Europe and a substantial ‘left behind’ population in terms of both income and geography. Whatever we’ve been doing in terms of economic policy hasn’t been a terrific success. 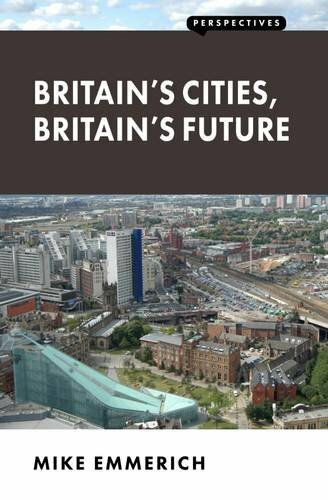 Mike’s book makes a persuasive case for taking advantage of recent signs of urban renewal in the big cities outside London and ensuring that the momentum continues. He blogged about it here if you want a foretaste of the book. 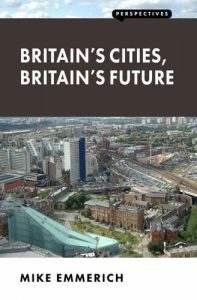 The latest in our Perspectives series is out now: Britain’s Cities, Britain’s Future by Mike Emmerich. Mike, for those who don’t know him, was a key architect of the devolution deal for Manchester, and prior to that had worked in the Treasury and 10 Downing Street. It’s hard to think of anyone who has had such a ringside view – from both sides – of the debate about the role of the UK’s major cities in the economy and society. 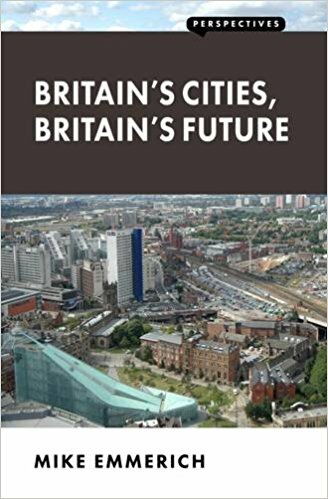 The book starts with the historical perspective, looking (from the perspective of agglomeration economics and political economy) at why the big industrial cities like Manchester, Liverpool, Sheffield and Birmingham rose, and declined, and may be on the point of renewal. The following two sections reflect on the role of cultural and social life, and institutions and politicla governance, in explaining the fortunes of a city. 1. More and better transport, with political consensus so the projects get delivered. 4. Strong local skills institutions involving (& funded by) both employers and the state, and different in different cities, not national templates. 5. Create jobs for the people ‘left behind’ starting with high quality, publicly funded temporary jobs in their community. This all requires a long-term planning horizon, money, and above all political commitment at the centre and locally. A tall order perhaps, but with a better chance of hapening now than at any time since the 1960s. If you want to know more, Mike’s your man, and the book is available to pre-order now – with you by the weekend. BTW, this is the 11th Perspective, and we have some cracking new ones in the pipeline. There are a couple of promotional offers available for a while, one for the existing titles, and a discounted subscription to the forthcoming ones. A land built by economists? Last week I took part in a workshop organised by the National Infrastructure Commission on the economics of infrastructure and growth. It was fascinating, and particularly for illuminating a dilemma for economists thinking about the newly-prominent issue of infrastructure investment. 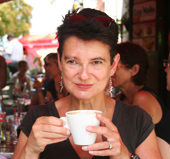 It’s a Good Thing – but how much is needed, and which investments? How should the NIC advise on the choices most likely to increase economic welfare and growth? There is some well-understood machinery for answering such questions, in the form of appraisals (or post hoc evaluations) using cost-benefit analysis. The trouble is that although the technique, firmly embedded in policy advice, is useful for assessing relatively small changes, it is next to useless in the context of big investment projects that involve externalities such as environmental costs and benefits or network effects, might change people’s behaviour significantly, or might have non-linear impacts which accelerate beyond a point of critical mass. These are, of course, situations that might often arise with big infrastructure projects. And the challenge is all the greater because different kinds of infrastructure will affect each other (transport and communications networks will be complementary, natural capital and flood defence schemes will interact). To cap it all, there is an economic geography dimension to this, and infrastructure will affect the distribution of economic activity over space, which will also affect the distribution of economic opportunities and incomes. So these questions are difficult, and nobody thinks economics can answer them. What was interesting about the discussion and subsequent emails was the emergence of a basic dilemma. One of the strengths of the conventional economic approach is the intellectual discipline it enforces. Cost benefit analysis looks at the direct benefits of a project to users, and converts them into a single unit of measurement, money (although it could be owls, or happy faces). It is a powerful brake on wishful thinking. Economics also sets out the circumstances in which wider benefits might need taking into account: when there is good reason to believe that resources are misallocated so the investment might lead to a more efficient outcome (land use in the UK would be an example – the planning system enforces many inefficiences); when there is good reason to expect a project will bring about agglomeration externalities, the additional productivity arising from there being more people in one area because there is a deeper pool of labour and skills, and know how can spread more easily; when there is reason to be confident there will be non-marginal benefits that private investors will not capture; and when infrastructure can act as a mechanism to co-ordinate private investment decisions. The latter is interesting because it suggests the prospect of multiple equilibria depending on which place or project is selected as the focal point for co-ordination. I would add another complication, which is the scope for small changes in transactions costs or frictions to bring about big changes in behaviour. In some contexts a time saving of 10 minutes will be marginal but in others it might tip a lot of people changing their commuting or house purchase patterns. A past example is the switch from dial up internet to broadband; many economists thought this would be a small change, but it turned out to be revolutionary. The behaviour change point makes post hoc evaluations tricky, because the behaviour is endogenous to the infrastructure choices. Everybody in the workshop broadly agreed about the basic intellectual framework (well, we were almost all economists) but the dilemma is whether it is ever feasible or sensible to allow consideration of the wider benefits. The case against – and in favour of sticking to narrow, conventional cost benefit analysis – says stick to situations where there are clear signals from market prices. For example, is there a big difference in land prices indicating resource misallocation? Otherwise, there is a danger of the kind of mistakes that have always come with ‘picking winners’ in the past. The opposing case for being more open to trying to estimate wider benefits is to ask: what would the country look like if built by economists? It would be a dreary place of functional concrete boxes in a mesh of motorways. The Victorian infrastructure we still rely on would never have been built if subject first to a cost-benefit analysis. Britain used to be considered a world leader in infrastructure but then the use of cost-benefit analysis spread widely, and now we are clearly laggards. I’m firmly in the camp that we should be looking to develop new techniques and data to inform a wider approach. The UK economy needs infrastructure investment that will make a big difference to productivity and growth, given the self-inflicted economic headwinds we face. We need faster growth in the great provincial cities, and significant investments that will make a step-change difference in the economic well-being of people around the country in terms of air quality, flooding etc. The NIC faces quite a challenge, but also a tremendous opportunity. My favourite books about infrastructure are Brett Frischmann’s Infrastructure: The Social Value of Shared Resources; and my colleague Richard Agénor’s (more wide-ranging) Public Capital, Growth and Welfare. Ricardo Hausmann has written about the distributional impact of infrastructure (along with natural capital, the most significant capital people on low incomes have access to).